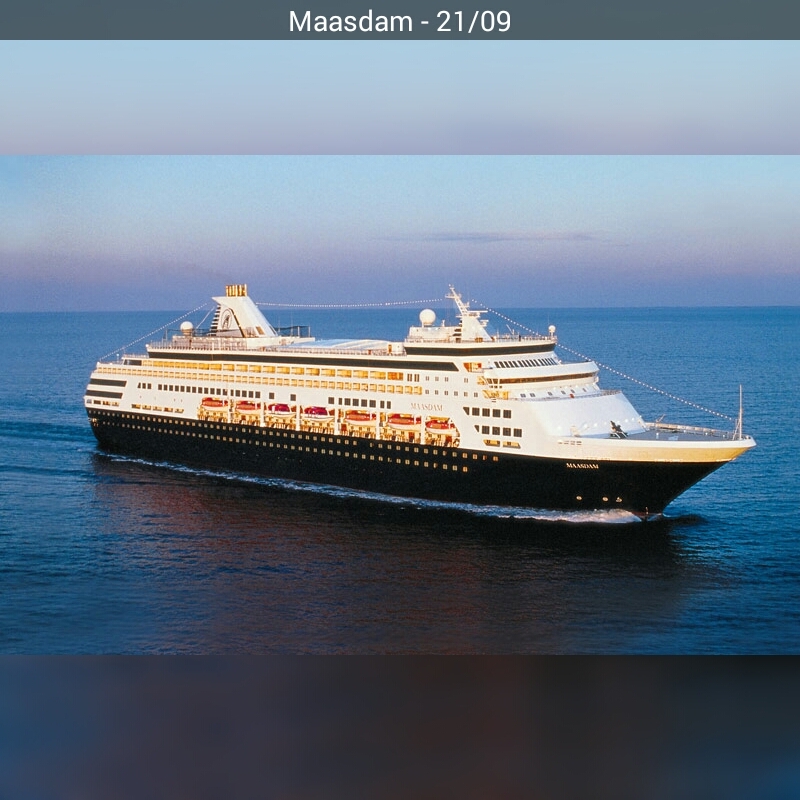 Volendam is an Rotterdam class (R class) cruise ship operated by Holland America Line as a subsidiary company of Carnival Cruise Lines. She has three sister ships in the fleet, Zaandam, Amsterdam and Rotterdam. She was the second of these ships to be launched, the Rotterdam being the lead ship of the class. Volendam is 238 m (781 ft), a 32.3 m (106 ft) beam, and a 8.1 m (27 ft) draft. She has ten decks, and contains cabins for passengers (called staterooms) on decks one through three (Dolphin, Main and Lower Promenade decks), and decks six, seven and eight (Verandah, Navigation, and Lido decks). The ship's theme is flowers, and she features floral designs throughout. The atrium contains a sculpture spanning three decks which was created by Luciano Vistosi. Volendam was christened by former professional tennis player Chris Evert on 12 November 1999, who became the ship's godmother. As part of the Holland America Line's fleet upgrade to include a program of Microsoft digital workshops on board, Volendamlaunched its program on 27 May 2009. She also contains other standard elements onboard Holland America Line vessels, such as the Explorations Café, a show lounge, a spa, and children's clubs. There is a total of eight bars, two pools and two hot tubs. Dining options include the Rotterdam Dining Lounge, and the Pinnacle Grill, which is the ship's signature restaurant and features evenings recreating New York's Le Cirque restaurant. The Lido Deck (Deck 8) features two pools, two hot tubs, a grill, a recreation area (poolside; includes ping-pong table, chess board and more), and the Lido Restaurant. The Lido Restaurant serves food from around 07:00 am – 12:30am, the Lido Restaurant closes to prepare for lunch after breakfast, and dinner after lunch. The Lido has different sections for different cultural cuisine, such as Filipino, Indonesian, Moroccan, Italian, Swiss, and more. Each and every night, the Lido Restaurant offers different kinds of cultural foods, each specified in a menu before entering. The Lido Restaurant also features the Canaletto Italian Cuisine for those who wish to have their own sectioned off area to eat.